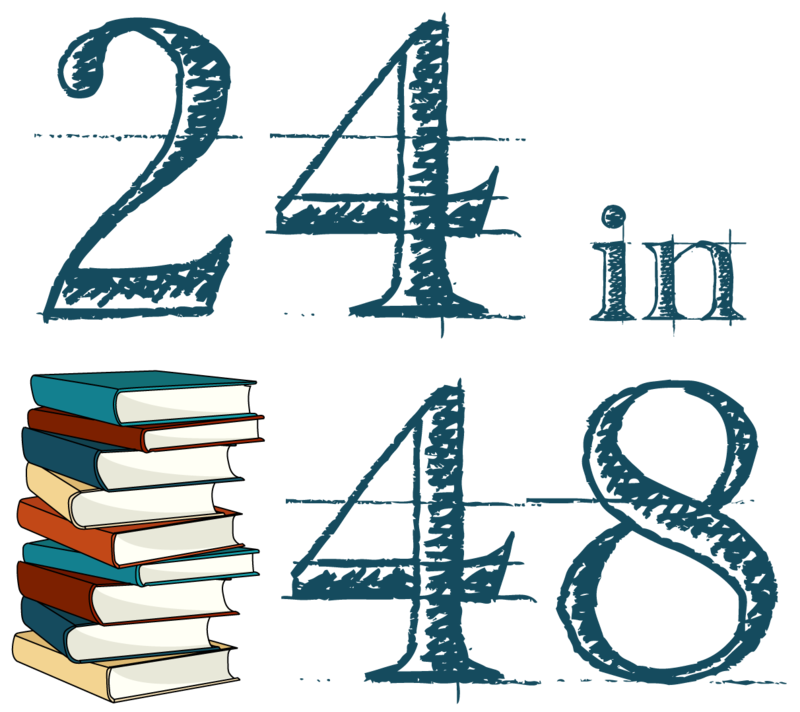 Welcome to #24in48 – January 2016 Edition! It begins! Hold onto your hats, kids – we’re about to dive into a weekend of awesome. Right now, it is 12:01am ET and I am, as always, asleep when this shindig starts. Because this is – after all – the readathon for people who like to sleep. Some of you are starting now, whether this is because you’re in a different timezone or you’re a night owl who likes to get a jump on things. And some of you are sleeping just like me. If you’re just now discovering the ‘thon or have been unsure of your weekend plans, you can still sign up and do so throughout the weekend. I’ve heard from lots of you about your plans for this weekend and some of you have excellent readathons lined up. Someone’s tackling FOUR Haruki Murakami novels and another readathoner is doing nothing but short stories – 24 of them to be exact. And some of you are working your reading into an already busy weekend with audiobooks and ebooks on the go. No matter what your strategy for the next 48 hours, its guaranteed to be a good readathon. Follow along on Twitter at @24in48readathon and keep up with your fellow readers with the hashtag #24in48 on Twitter and Instagram. Even though the “rules” say that the goal is to read for 24 out of 48 hours, it’s just a number to shoot for. The real goal of this weekend is to set aside some serious quality time to do nothing but read with a bunch of other people doing the exact same thing. Your time reading still counts even if you don’t hit 24 hours. Take a break, get some sleep, eat well. This is a marathon, not a sprint. And it’s supposed to be low pressure. Don’t kill yourself. That being said, try to start with a rough schedule so that you don’t overextend yourself on Sunday night, if you are shooting for that 24 hour mark. Give yourself more time to read on Saturday than you think you’re going to need, because you undoubtedly won’t have as much as you think. You can’t win a prize unless you’ve signed up on the main sign up post, so definitely do that. If you win, I’ll be emailing you in the next week to collect your details, so make sure your info is accurate. I’ll be back at 6am ET with the next update! Happy readathon! I’m so excited! Prep for #24in48: What to Read? Are you staring at your shelves, planning for the readathon and feeling overwhelmed, like me? Get a stack of books for Christmas or Chanukah and don’t know where to start? Or want to change things up in 2016? I’ve got some ideas for you. As it’s a new year, everyone seems to be making reading resolutions, of all kinds, and the readathon is a great excuse to get a jump start on those resolutions. I have to plug the 2016 Book Riot Read Harder Challenge, since I wrote it. It’s 24 tasks, designed to help you expand your reading horizons and help you push yourself to read things you might not otherwise would have. It’s so much fun and there is a Goodreads group (along with the suggestions in the linked post) to help you with the tasks. Personally, I’ll be fulfilling the task for reading out loud to someone else be regaling my dog with a story, preferably one that requires a lot of voices. If you’re looking for some comics to read during the readathon, also check out the 2016 Panels Read Harder Challenge, which is the same idea as the Book Riot Read Harder Challenge but for comics. If you’ve got mountains of books in your house that just never seem to get read (despite the fact that you keep buying new ones), check out Andi’s #ReadMyOwnDamnBooks challenge which is exactly what it sounds like. Pull your readathon list from the books you already own and feel a little better about that other resolution to buy fewer books/spend less money. Do you have a similar problem with ebooks? Kerry’s #CleanYourReader challenge runs until March and is all about finally reading some of those ebooks filling up your reader. I’ve definitely got a couple of romance novels I’m planning on reading during the ‘thon from my reader. Looking for more ideas? Check out Bustle’s list of 9 Reading Challenges to take on in 2016 (it includes the Read Harder Challenge too). I hope that gives you some ideas and some inspiration for the readathon. In the next few weeks, I’ll be posting a few more ideas and suggestions for your weekend ‘thon. If you haven’t signed up already, what are you waiting for?? Join the 80+ readers already participating.